Here’s an example of a recent studio project that’s got us feeling inspired: A collaboration with the brilliant team at Accessibility Media Inc (AMI). Together, we created AMI-tv for iOS and tvOS. It’s the first and only video app made especially for the blind and partially-sighted community. Driven by a belief in an inclusive society, AMI’s mission is to be a world leader in accessibility. But companies of all stripes — not just those with an advocacy mindset — have a pressing need to focus on inclusive product design. Did you know that: More than one billion people in the world live with some form of disability. At least one-third of all families are impacted by disability in some way. Life for people with disabilities is the same as everyone else, just a lot harder. This project strengthened our belief in the power and importance of Universal Design, and deepened our understanding of how to build truly accessible apps. Building inclusive products benefits everyone, so here are 10 compelling arguments to use when creating your own accessibility business case. Global awareness of the importance of accessibility is increasing. Yet many of the world’s most popular apps — like Uber and Snapchat — still aren’t accessible. Prioritizing accessibility demonstrates genuine leadership, showing your commitment to building a more equitable world. Through technology, you have the power to unlock meaningful new opportunities for people with varying levels of abilities. Designing for inclusivity not only opens your products up to more people — it also reflects how people really are. Governments around the world have put forward legislation requiring technology products and services become compliant with accessibility standards, and deadlines for those requirements are fast approaching. In addition to government legislation, the UN Convention on the Rights of Persons with Disabilities recognizes web accessibility as a basic human right. A focus on accessibility reduces your risk of legal challenges. Accessible products can increase your market share. For example, over 7 million people in the United States are living with significant visual impairments, and that represents a real opportunity for your business. Accessibility and usability are closely related practices, influencing loyalty, retention, conversion rates and more. Look at Amazon, Vimeo or Facebook for examples of apps that use universal design principles to create powerful user experiences. One thing we learned from talking to people in the visually impaired (VI) community is that these individuals often feel lonely, but are supported by tight-knit digital communities. Participants in these groups are well-connected, frequent sharers who are excited to spread the word about accessible apps and services with their networks. Creating a frictionless web or mobile experience for people with a diverse range of abilities means they have less need to interact with you in other, more expensive ways like over the phone. Building accessible products for your team can increase retention, and widen your recruitment opportunities. Many accessibility challenges, like low vision, are also common signs of aging that will be affecting significant swathes of any boomer-heavy workforce now and in the future. Apple believes that the most powerful technology in the world is technology that everyone, including people with disabilities, can use. Their team of accessibility engineers has built a highly-sophisticated set of tools for iOS to make the experience accessible. 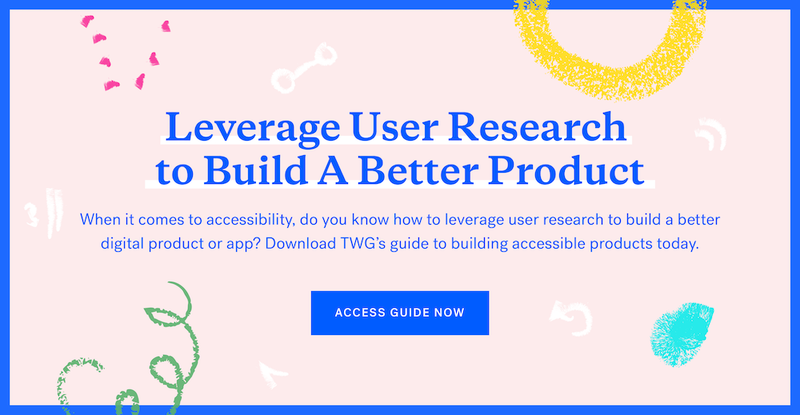 Now is a great time to leverage this work as a starting point for your accessibility projects. Every organization has different needs and motivations, but we hope the points above prove useful if you are driving product accessibility conversations amongst your team. If you would like to partner with a product team that’s passionate about accessibility, inclusivity and Universal Design, we’d love to talk.